Sir Paul McCartney saw the "funny side" when he took a tumble after a gig, according to reports. The music legend, 69, fell down stairs while leaving the stage in Liverpool, The Sun reported. A source said the ex-Beatle "just dusted himself down", adding: "He's not accident-prone so it's unusual for him to be clumsy. "He saw the funny side." Macca was reported to have had a spectacular fall during a curtain call in Brazil earlier this year, tripping over cables and ending up on the floor face first before jumping up again. Comic Peter Kay, who had also attended a Macca gig the previous night in Manchester, was among the fans at Liverpool's Echo Arena. Sir Cliff Richard has revealed he's up for a duet with Rihanna or Lady Gaga - as long as the song is up to scratch. McFly have kept to their word by posing naked for a photo after pledging to do so if bandmate Harry Judd won Strictly Come Dancing. George Michael has been released from hospital in Vienna and will be able to celebrate Christmas at home, Austria's state broadcaster has reported. The editor of a Dutch fashion magazine has been fired after the publication used a racial slur to refer to Barbados-born Rihanna. Tinie Tempah and Labrinth have joined the line-up for next year's Isle of Wight Festival. 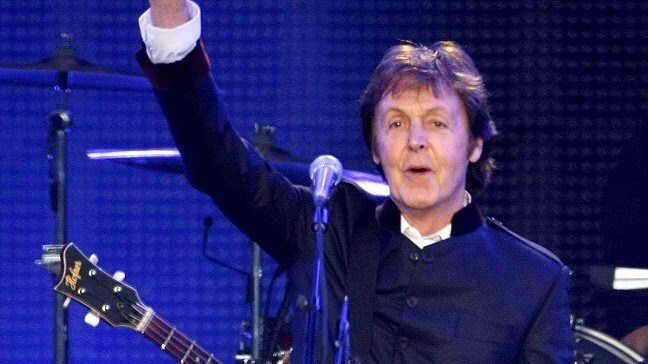 Sir Paul McCartney has been honoured in his home city with an "icon" award.